Chuck Cooper in Amazing Grace. Photo by Joan Marcus. BOTTOM LINE: A historical musical with some historical trouble. In the opening moment of Amazing Grace, the new musical from Christopher Smith and Arthur Giron, Chuck Cooper’s narrator gives us the backbone of the story about to unfold: John Newton, composer of the beloved hymn woven deeply into the very fabric of Christianity, was a leader in England’s booming slave trade before his conversion to a life of faith. When we discover young Newton (sung beautifully by Josh Young, Tony-nominated as Judas in Jesus Christ Superstar), he is newly returned from sea to his hometown, pining for a life of meaning. The son of Captain Newton (played admirably by Broadway veteran Tom Hewitt), John is a young man of great privilege, living lavishly off the handsome profits of his father’s slave trading outfit, but fumbling as he finds his own path. In an act of defiance, he takes over a postponed auction of a newly delivered shipment of “workers,” only to see the gathering disrupted by abolitionist radicals who escape with a stolen slave. Through a variety of historical embellishments, the ensuing consequences of his mishap see him fall out of favor with his love interest Mary Catlett (a sweet Erin Mackey), and disparaged by his father who allows him to be press-ganged into navy recruitment and sent to sea off the dangerous coasts of Africa. When his ship is attacked by the French, Newton is marooned in Sierra Leone, where he faces the tribulations that ultimately lead to his climactic “lost to found” conversion. Where the musical falls most egregiously short, though, is in its treatment of the charged subject matter, especially in light of the current political moment (performances began only a few days after the terrorist attack on a church in Charleston, SC). The authors' Playbill note expresses their interest in contributing to this dialogue, and an awareness of the sensitivity demanded in representing the wretched history surrounding Newton’s biography. Unfortunately, the production does little to accomplish these goals, save for a couple of a token ballads from the secondary African characters, rife with cliché aphorisms (to be fair, the clichés are shared across the cast with reasonable equity). 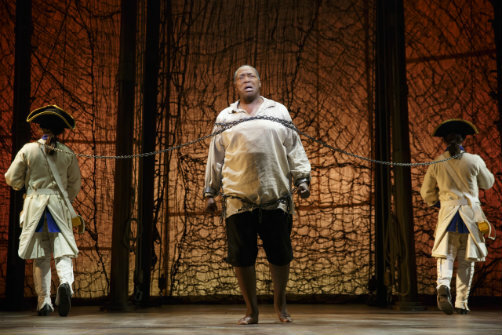 As the show confusedly begins with the elitist white protagonist belting his wish to be “truly alive,” moments before a crate of shackled, naked black slaves is dragged onstage, you are left anticipating an eventual lyric reversal that might make this uncomfortable juxtaposition worthwhile. But when the evening finally reaches its rushed and bewildering climax with Newton declaring through tears “I won’t be ashamed to stand and proclaim I am free” (...from his oppressive desire to traffic humans? ), there is little left to hope for. And in a final turn of stunning disregard for subtext, a strained and unnecessary detour suggests John actually stole the melody of his fame-making song from a young African woman, who has been enslaved by her own people for some two decades. Though Cooper and Hewitt do well to keep the production engaging with finely crafted performances, and the design team dazzles time and again, the source material is rendered quite ungracefully. There is enough backhanded racism and historical revisionism whitewashing everyday America. Broadway owes its audience more.